Since 2008, German cities can legally designate low-emission zones that only motorized vehicles with an emissions sticker are allowed to enter. This sticker is called Umweltplakette or Feinstaubplakette in German. Older and polluting vehicles are not eligible for emissions stickers and are as a result barred from entering low-emission zones. Order the official German emissions sticker, now for only €12,50 including VAT and delivery costs. On this website, you will learn more about the German emissions sticker. To find out which cities have designated low-emission zones, please see this page with a map and a list of all cities where you need an emissions sticker. To buy a sticker for your vehicle, visit our order page. The German emissions sticker comes in three colors: red, yellow and green. The red sticker is for the most polluting vehicles, the yellow sticker for slightly less polluting vehicles and and the green sticker for the least polluting vehicles. As of 2019, vehicles with a red emissions sticker are no longer allowed to enter any low-emission zones in Germany. Red stickers are therefore no longer for sale. Vehicles with a yellow sticker are only allowed to enter the low-emission zone of Neu-Ulm in Bavaria. Unless you plan to visit Neu-Ulm, obtaining a yellow sticker is a waste of your money. Vehicles with a green sticker on the other hand, can enter all low-emission zones in Germany. This green emissions sticker is the one you should obtain if you intend to visit German cities with a low-emission zone. Vehicles equipped with an electric engine such as the Tesla Model S.
Vehicles equipped with a petrol, LPG or hybrid engine that meet the requirements of emission standard EURO 1 (1 January 1993 and newer). Passenger vehicles (M1) and light commercial vehicles (N1) with a diesel engine that meet emission standard EURO 4 (1 January 2006 and newer). Trucks (N2 and N3) and buses (M2 and M3) with a diesel engine that meet emission standard EURO 4 (1 October 2006 and newer). Vehicles equipped with a diesel engine that meet emission standard EURO 3 and are retrofitted with a diesel particulate filter (DPF). Please note that the years mentioned between parentheses are indicative only. For instance, a vehicle with a diesel engine from before 2006 can already meet the EURO 4 requirements, while other vehicles from 2006 or later may not. The latter is often the case with motorhomes and campervans, but also depends on the manufacturer of the vehicle. On many vehicle registration certificates issued within the European Union, the emission standard is mentioned under item V. The vehicle category (M1, M2, M3, N1, N2 or N3 as indicated above) is mentioned under item J and the fuel type under item P. Item B shows the date of first admission. Any occupant of the vehicle has a blue EU parking card for people with disabilities. Within a low-emission zone, you should place this card on your dashboard so that it is clearly visible from outside the vehicle. The vehicle belongs to a non-German military force that is part of NATO, stationed in Germany and taking part in a mission or in military matters. Antique cars that comply with the requirements of Oldtimers in §17 of the German directive on vehicle registration. Proof of compliance should be placed on your dashboard and should be clearly visible. Vehicles that never require an emissions sticker include motorcycles, mopeds, scooters, agricultural machinery, police cars, fire trucks and ambulances. These vehicles, even when not registered in Germany, can enter German low-emission zones without restrictions. A low-emission zone in Germany is a zone which motorized vehicles can only enter with an emissions sticker. 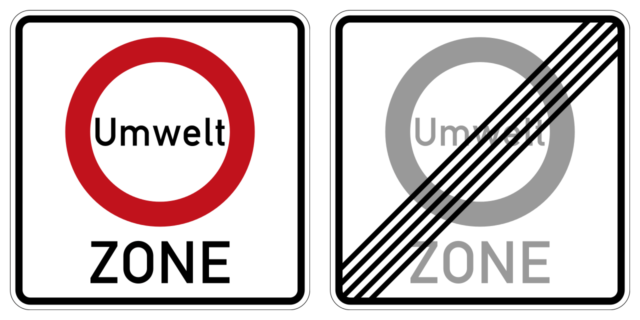 In German, these zones are called Umweltzone which translates as environmental zone. As of 2019, Germany has 58 low-emission zones comprising more than 70 cities. Most of these are in the states Baden-Württemberg and Nordrhein-Westfalen. An overview including a map with all zones can be found on this page. The beginning of a low-emission zone is indicated by the sign on the left. The sign on the right indicates the end of a low-emission zone. Keep in mind that these signs may not be placed along minor roads leading into and out of a low-emission zone. Frequently asked questions about the emissions sticker are answered below. Did you place an order on this website? Then have a look at this separate page with frequently asked questions about your order. In Germany you can buy an emissions sticker at vehicle inspection companies such as DEKRA, A.T.U and TÜV. Most larger car dealerships will also help you out. Online, you can order the sticker through this website. What is the fine for not having an emissions sticker? If you enter a low-emission zone without a German emissions sticker, you will be fined €80. If your car has a red or yellow emissions sticker and you enter a zone where a green sticker is required, you will also be fined €80. Which German cities have a low-emission zone? Please have a look at this page for a map and a list of all low-emission zones in Germany. Do I need an emissions sticker on the Autobahn? No, an emissions sticker is not necessary on the German highway (Autobahn), even when this highway goes through a low-emission zone. Can I use the emissions sticker everywhere in Germany? Yes, you can use the same sticker everywhere in Germany. The only prerequisite is that the color of the sticker must be the same as the color required in the low-emission zone. As of 2019, all cities except Neu-Ulm require the green sticker. In Neu-Ulm both the yellow and the green stickers are allowed. Does the emissions sticker expire? As long as your license plate number and vehicle do not change, the German emissions sticker does not expire. If your license plate number changes, a new sticker is necessary. It is also not possible to transfer your sticker together with your license plate number to another vehicle. 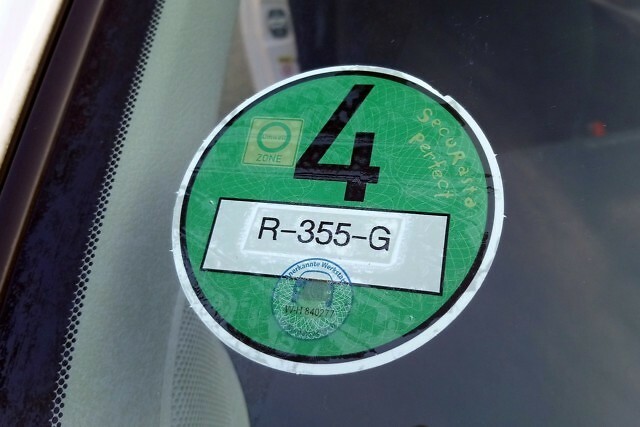 If the license plate number on your sticker is no longer readable, for example because of the influence of sunlight, then a new sticker is also needed. Where do you place the sticker? Affix the sticker to the inside side of your windscreen so that the green side and your license plate number are visible from outside. The best place is on the right side of the windscreen, as seen from the position of the driver. What do the different colors of the sticker mean? The German emissions sticker comes in red, yellow and green. The red and yellow stickers are for older and polluting vehicles with a diesel engine. The green sticker is for newer and less polluting vehicles. As of 2019, the red sticker is no longer valid and the yellow sticker is only accepted in Neu-Ulm. All other cities with low-emission zones now require the green sticker. Is an emissions sticker necessary for electric cars? Yes, an emissions sticker is also necessary for electric cars such as the Nissan Leaf and the Tesla Model S.
Is an emissions sticker necessary for motorcycles? No, an emissions sticker is not needed for motorcycles, scooters and other motorized vehicles on two wheels. These vehicles can enter German low-emission zones without an emissions sticker. Is an emissions sticker necessary for antique cars? When your vehicle complies with the German regulations for Oldtimers, as antique cars are called in Germany, you can enter a low-emission zone without a sticker. The exact requirements can be found in §17 of the German vehicle registration regulation. Can I use my emissions sticker from a different country? Several other European countries such as France, Spain and Italy have also introduced emissions stickers to curb air pollution. Unfortunately, these stickers are not valid in Germany.